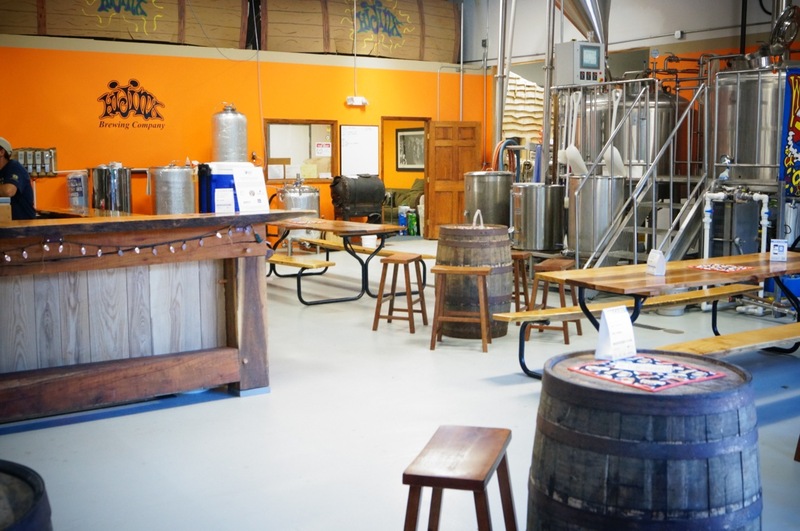 Down the road from Allentown’s center of town near Fairview Cemetery in an inconspicuous warehouse, HIJINX BREWING COMPANY crafts a wide assortment of delectable elixirs. Headed by experienced brewer, Curt Heck, a former homebrewer who joined defunct Old Lehighton Brewery in ’96 before landing at well-regarded Weyerbacher in ’97, Hijinx opened during 2014 and occupy a high-ceilinged 4,000 square foot space. On a cold Friday evening in late October ’17, my wife and I spent a few hours at this pleasantly roughhewn brewpub. Right alongside a Meadery and a distillery in the same industrial complex, Hijinx had twelve draught beers available on our initial sojourn. A large open garage door welcomed us to the cement-floored joint. Two community tables and several wood barrels sidled the hardwood bar while the brewtanks were stationed across the room. Keen local faves, the Peter Johann Band, played a few hot sets while we kicked back and enjoyed five well-balanced brews (and bought many more for home consumption reviewed in Beer Index). Spunky Wicked White doused zesty orange peel briskness atop muted coriander spicing, distant banana tartness and herbal Belgian yeast funk. Earthen peat musk gave an Extra Special Bitter-like profile to Tail Pale Ale, a nifty IPA crossover with dry orange, apricot and tangerine tanginess picking up raw-honeyed astringency. Dewy peat mustiness, dry rye malts, soily truffle nuances and mild apple-pear fruiting caressed easygoing Pitch Penny ESB. Spicy hop-tingled citrus fruiting serenaded sessionable Party Guy Ale, a pale-malted moderation with tangy orange-tangerine-grapefruit licks sidling dried prune, sour cider and sweet peach notions as well as tertiary vegetal snips. Red and orange fruiting dabbed Far Darrig Irish Red, a mildly spiced smoothie with amber-grained toffee malting.